Storm the Colosseum with the new Rome: Rise of an Empire video slot from Blueprint Gaming has no less than 10 bonus features. With an epic feel, you go on a journey to the land of the ancient Romans which comes with 5 reels and 20 paylines. Available to play on desktop, mobile and tablet devices from 20p a spin, you get to don your virtual toga and benefit from a total of 10 bonus features. With swords, helmets, shields, empresses and gladiators on the reels, look out for the SPQR Eagle as this is the wild and replaces all symbols bar the scatter. In the base game, the tiger can spring to life rewarding you with 1 of 5 bonus features, randomly. Swords can hack away rows to give you new symbols whilst up to 3 stacked wilds can be added. You’ll also get transforming symbols which convert to wilds, streak spins and more bonus scatters so you get to access the 5 main bonus features. The 5 main bonus features offer you picks to win cash prizes – there’s also 2 free spins features where there are multipliers up to 5x, a final free spin with a multiplier up to 10x and Empress Wilds which expands and lock in place. The main extra is the Big Money Bonus feature where big cash prizes are on offer. 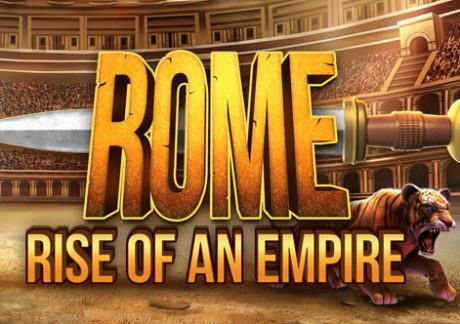 You can play Rome: Rise of an Empire at Videoslots Casino who have a full portfolio of Blueprint Gaming titles – they actually have the largest selection of video slots found anywhere online (hence their name!). As well as other new releases including Chance Interactive’s Buster Hammer Carnival and Play ‘N Go’s Raging Rex, they have started adding Playtech games with Tiki Paradise, Miss Fortune and Buffalo Blitz available (amongst others). With a sterling reputation, 24/7 customer support and same-day cashouts, you are welcomed with a 100% match bonus up to £200 plus 11 welcome spins on NetEnt’s Starburst (with no wagering requirements).